Support and motivation via the closed Facebook group and full access to the 8 week programme for 6 months. This is the one for you if you are self-motivated but want all the guesswork taken out of losing weight and getting fit. Be amazed at what you can achieve in 8 weeks by following the programme and having support from a community of like minded women. We are all here for you! Amazing life transforming 8 week flexible program for any age fitness level lady !! I tried and failed so many of the mainstream well known “diets”. This is so much better! The personal approach, the level of support, the concentration on many areas of your life which all factor into weight and diet issues – those have been doing it for me. The latter especially I’ve found really helped address causes not just symptoms! After 8 weeks the habits are ingrained. It isn’t a “diet” and it isn’t some health kick – it is how to mould and shape your lifestyle to be the best you that you can be! I can not recommend the 8 week kickstart programme enough! Lorna is with you every step of the way. The online support group is fab with lots of positive feedback from likeminded ladies. I feel fitter, slimmer and happier. The healthy eating and fitness programme has continued past the 8 weeks, it’s amazing how much better I feel, much more energy and no afternoon slump, it’s life changing!! A lifestyle change and not a faddy diet – I really enjoyed this – everything from the closed Facebook group, daily articles and flexibility around exercise – it’s now 6 weeks since I finished the 8 week plan and still going strong. Super pleased with the results which have kept me motivated. Highly recommend! This is a brilliant programme. As a mum of a 1 year and 7 year old I needed something to fit around family life and work, satisfy my competitive spirit and challenge me and this did exactly that. I could fit the exercise programme in around (and during) dog walks, baby naps, unpredictable bedtimes and work, there was nothing to ‘cut out’ of my diet so what we cooked for me the entire family ate and most of all Lorna and the other women on the plan were super supportive along the way! Absolutely recommend it! Wow, Kickstart was brilliant! 8 weeks of having the most supportive trainer you could wish for, who also appears to have a sense of humour and can empathise with the pain you’re probably feeling during some of the workouts. I loved the articles which focused on different areas of life (sometimes I felt they were written with me in mind, they were SO relevant! ), I enjoyed trying out various recipes and I really enjoyed the mix of exercise. It’s also good that it’s flexible – I try to go to a HIIT class at the gym each week so then I just would omit Lorna’s HIIT class that week, or do it on a rest day if I was feeling really energetic. If you’d told me in January that I would lose 13lbs and 2 inches off my “problem” areas in the space of eight weeks, I wouldn’t have believed you…but it’s what happened. I feel fitter, healthier, cleaner, happier and better than I have for years AND YET I still go out to eat (and drink) with friends; I just make better choices. Lorna’s Kickstart Programme has basically given me a life overhaul, very gently but very thoroughly. 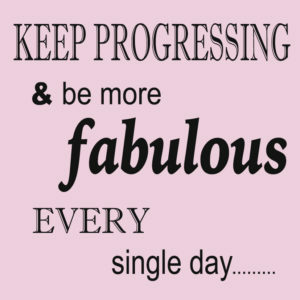 I can’t wait to move on to “Keep Progressing” and see what happens next.